St. Vincent Ferrer was born in Spain in 1357 and joined the Dominicans when he was 17. Soon he gave lectures on philosophy, obtained his Doctorate and began preaching and building up the church. He tried unsuccessfully to end the Great Schism, but was alive to see the end of it. He refused to be made a Cardinal and wanted only to be appointed apostolical missionary. He traveled thoughout Spain and then Europe, preaching, converting many and performing many miracles with God's help. 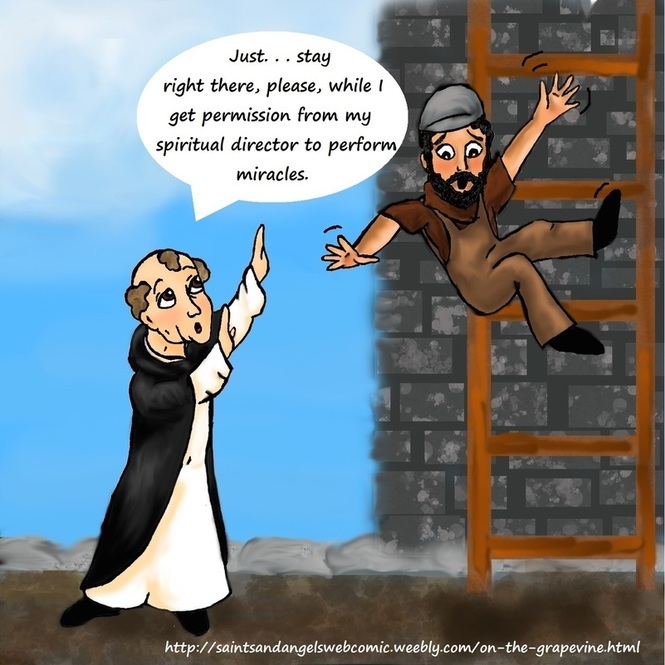 In this particular one, a construction worker who fell off the scaffold hung suspended in the air while St. Vincent ran to his spiritual director to obtain permission to perform miracles. He is the patron saint of builders. You can read more about him HERE.